Located right in the heart of the gringo trail is the beautiful city of San Cristobal, and while the city begs you to drop your bags and just hang out for a few days, make sure to spend a morning at Sumidero Canyon located about 30 miles east of the colonial city. Much like the Grand Canyon though obviously smaller in scale, Sumidero can be seen from five viewpoints along the roads at the top if you rent a car. However, also like Grand Canyon, a much better way of experiencing the canyon is from the river that created it. 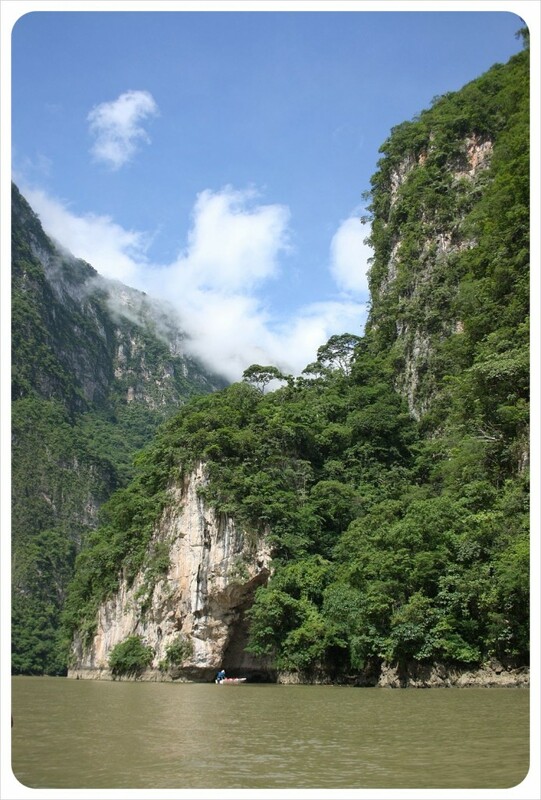 This canyon in the state of Chiapas, Mexico, is much more accessible than its U.S. big brother, with a 35km boat ride and tour leading through to the Chicoasen Dam, which provides a large part of Mexico and neighboring Guatemala with energy. 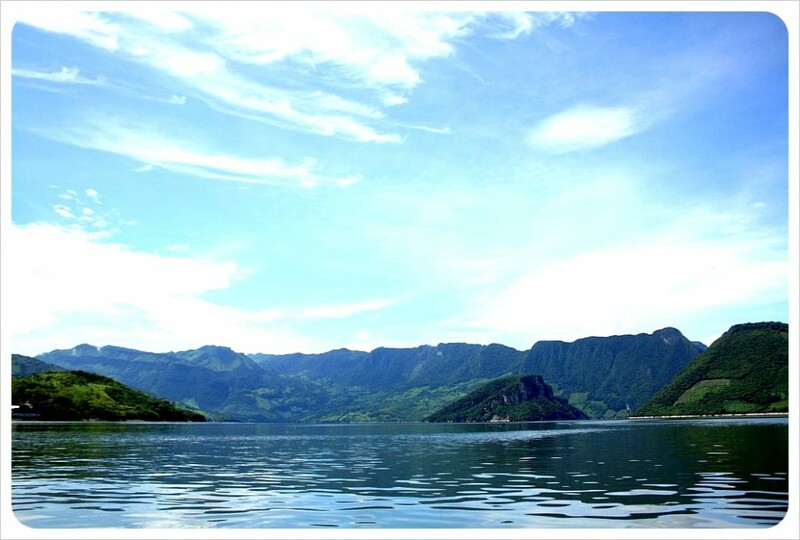 We highly recommend the boat tour, as there is so much wildlife on the shores of the river that you just can’t see from the top, and the 1 kilometer high steep canyon walls feel much more impressive when you raise your head and look at the peaks of the mountain walls surrounding you. 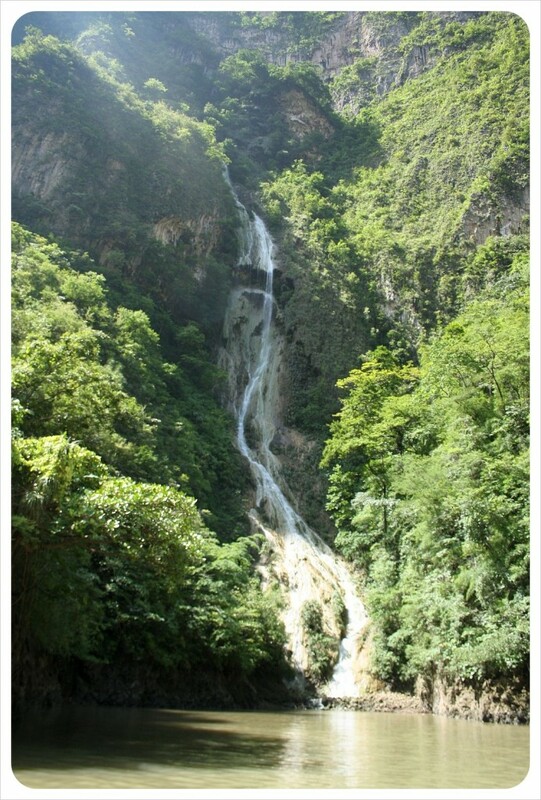 Sumidero Canyon is dotted with waterfalls (many of which are not visible from the viewpoints along the road) but Christmas Tree (Arbol de Navidad) is a waterfall unlike any other. The water spills from a hole above into moss-layered, green rocks that are shaped like the branches of a Christmas tree. The picture with the boat shows how big the waterfall actually is. For wildlife lovers there are a variety of birds such as herons and pelicans living in the canyon, but what draws the tourists are the four hundred crocodiles that inhabit the waters and the shores of the Grijalva River. 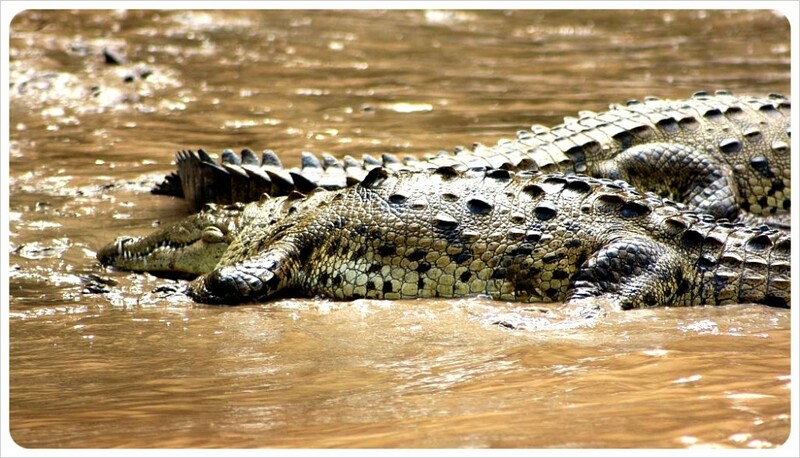 These crocodiles are up to six meters long, so try to avoid running your hands along the water as the boats glides along the river or you’ll inadvertently be dangling ‘lunch’ into the water for these crocs! Odds are you won’t want your hands anywhere near the water of the Grijalva River, unfortunately, as there is an ugly side to the Canyon. 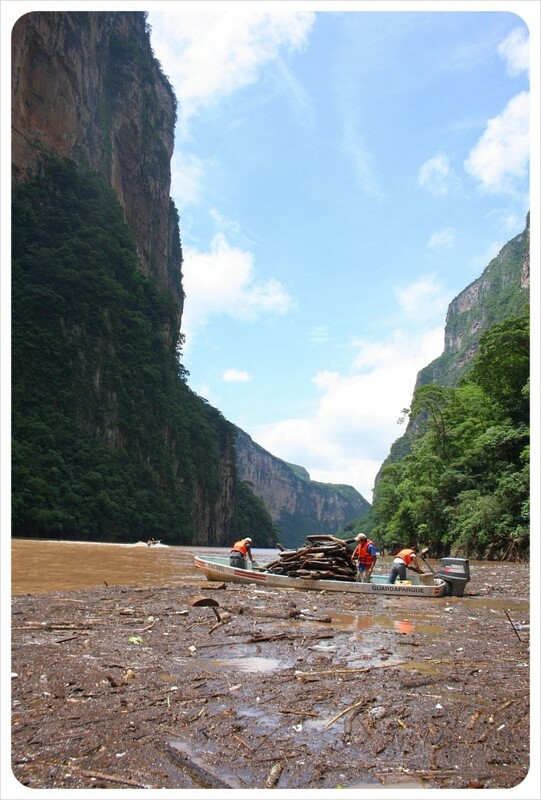 A few years ago, Sumidero Canyon received media attention for being polluted, especially during the rainy season when garbage from the surrounding villages washes into the Grijalva River. 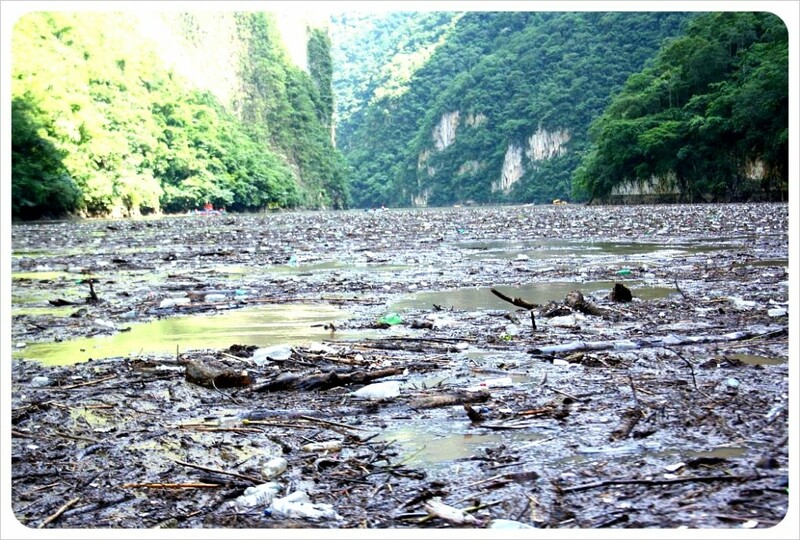 Most of the river has no trace of this, but there is one bottleneck where Styrofoam cups, plastic bottles, drift wood, milk cartons, plastic bags and other non-biodegradable materials all pile up in the middle of the canyon. In fact, it is even hard for the boats to navigate through the scads of garbage. The sight was honestly shocking, and makes the experience of appreciating the remarkable nature surrounding the river undeniably bittersweet. The amount of plastic bottles alone caused us to make a pact to everything we can to reduce the amount of drinks we buy in bottles, opting instead to mix drinks into re-used bottles as often as possible. 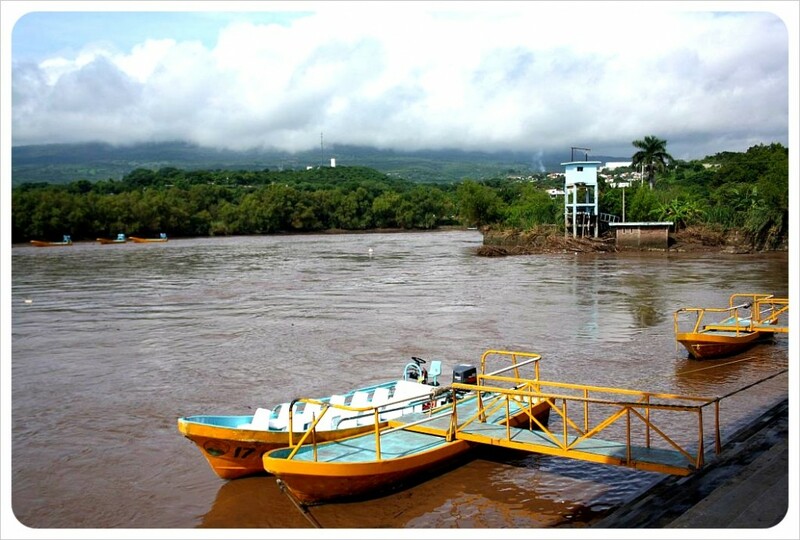 If the amount of garbage isn’t enough, there was a time when the state capital of Chiapas, Tuxtla Gutiérrez, directed their sewage system into the Sabinal River which feeds right into the Grijalva River (apparently this has been changed). This doesn’t mean that you should avoid the trip, but it does mean that there are more lessons to be learned while on the tour about just how serious it is to appreciate the nature around you. The canyon was hoping to become one of the ‘New 7 Wonders’, voted next year, and has initiated a massive clean-up program in order to accomplish this goal (unfortunately, it has not made it into the final 28). There are workers cleaning up the river constantly and according to our guide (who had a degree in biology and biodiversity), Chiapas is hoping to have a visibly cleaner river in the near future. This clean-up program can only bring good things to the wildlife in Sumidero Canyon. The boat tours last two hours and come with a very knowledgeable Spanish-Speaking guide. 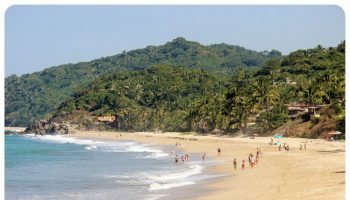 Tours from dozens of tour operators based in San Cristobal de las Casas cost 250 Pesos (US$ 19.00) and include also a short stop in the charming town of Chiapa del Corzo. If you happen to know someone with a car or can rent one, the tour fee itself is only 25 Pesos, but make sure to stop off in Chiapa del Corzo for lunch too, as it’s relatively untouched by tourism compared to San Cristobal. The pictures are amazing, especially the christmas tree waterfall. Shame about the pollution, but it seems that they are trying to make it better. It is scary how many plastic bottles we get through in an average day though! Plastic bottles are definitely the biggest issue, and there were so many just there. Another thing that shouldn’t be used anymore, but is all over the place in Mexico, is Styrofoam (cups, plates, etc). Anyway – I hope Mexico is on your list of countries to visit, if not: put it on there right now! 😉 It’s an amazing country, and so diverse. Yes, the Mexicans are not the most environmentally aware people (yet)… I guess it’s not much different in Guatemala. Are you guys still in Antigua? I was there in 2014 and I couldn’t see so many trashes in the water. I hope they took care of that. Thanks for the update 🙂 I’ve heard that it’s usually during and right after rainy season, when all the trash is washed down from other areas.